Little by little, I've been sharing with y'all corners of our new home that I've slowly decorated. Nothing fancy, nothing exceptionally mind-blowing. Just some updates I've taken on here and there. 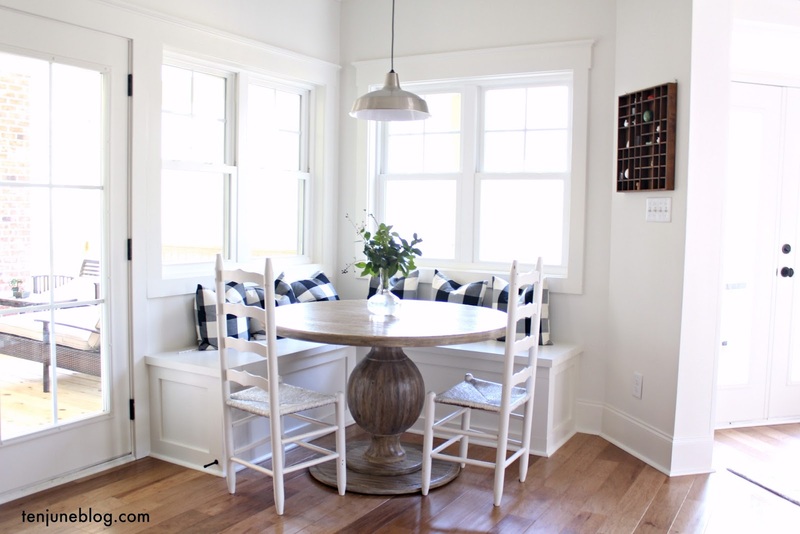 Today, I'm headed into another room of our house with a recent update. Like any good MTV Cribs candidate, I'd be amiss if I didn't show you guys a peek at "where the magic happens." The bedroom, baby. Well, more specifically, the bed! 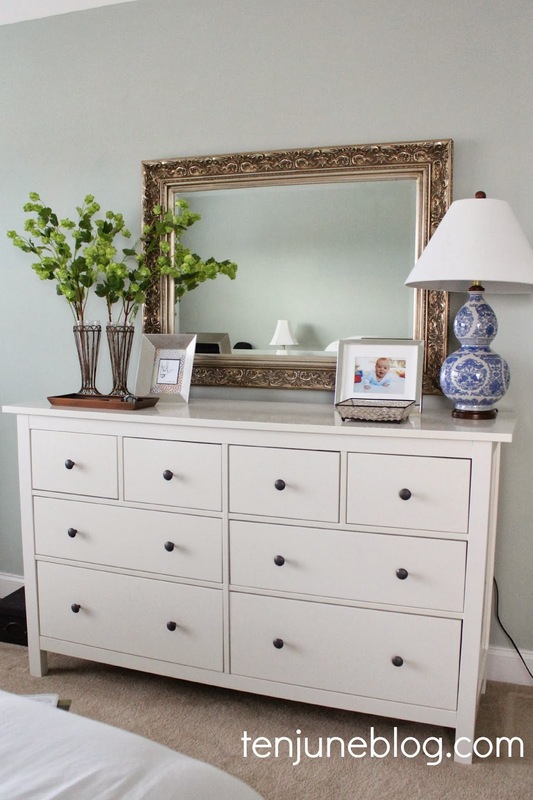 You've already seen what sits across from our master bed- my pretty little dresser and mirror vignette. On the other side of the room is our queen sized bed. It's currently looking fresh in its all white get up, but a little a lot boring if you ask me. 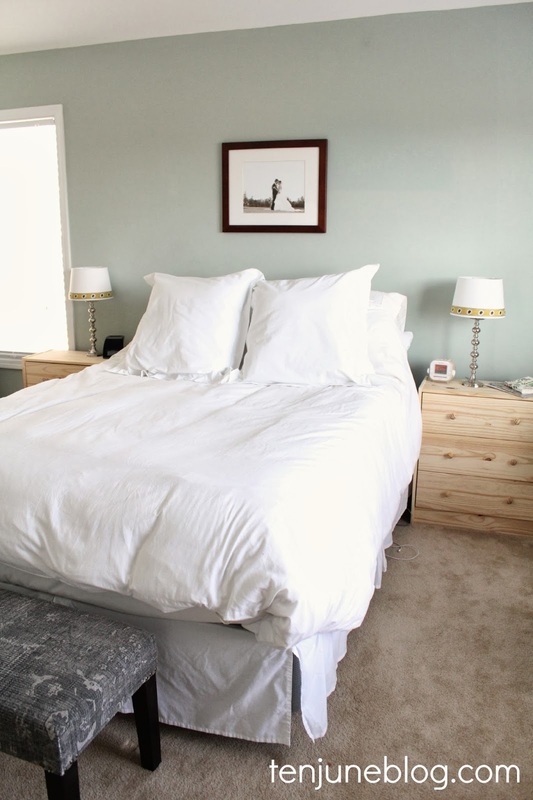 One sad look at this side of the room shows off some unpainted Ikea nightstands (dude, get on that, Michelle... I bought those like six months ago! ), some old school lamps that we've had for five or six years now and an unmade boring white duvet covered bed. Womp womp. And yes, I totally watermarked this "before" photo because I know you guys are going to go crazy with it on Pinterest. Pin away, friends. Sike. Recently, I made a few *small* tweaks to the area and I think things are headed in the right direction. The biggest change I've made so far is switching up the lampshades on the bedside lamps. I purchased two new white lamp shades from Target for $10 each. Then I added a strip of this trim from U-Fab. 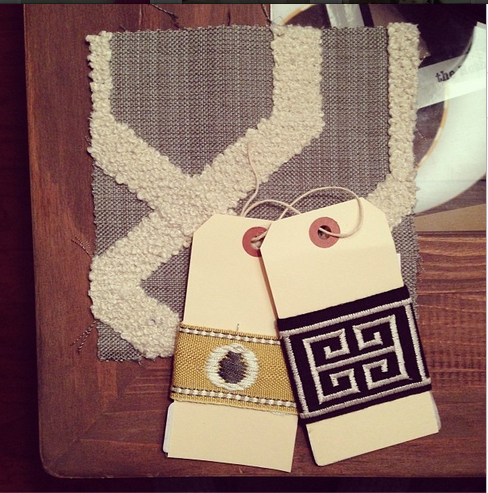 If you haven't heard of them, they're a crazy good online fabric store with lots of amazing decor fabric and trim. Check out their shop right here if you haven't before! Seriously, isn't that trim the prettiest dang thing you've ever seen? I love it! The trim makes the new lampshades pop. Totally custom looking. I'm thinking I'm going to use some Rub n' Buff to change the silver lamp bases to gold. What do you guys think? 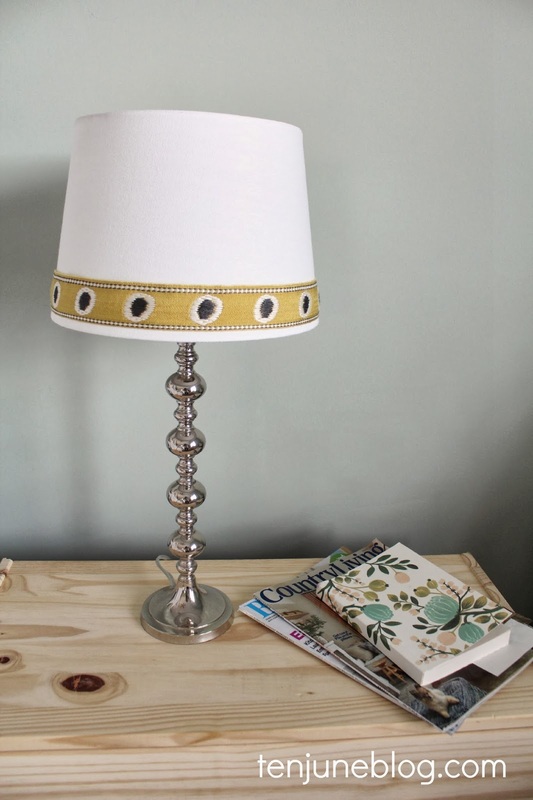 Do you like the lamps better in gold or silver? I also added some big ol' white (yes, more white) Euro shams to the bed. And no, I still didn't make up the bed all the way for these "after" photos. I'm a terrible blogger. But I also have a belly as big as a gigantic watermelon... a gigantic watermelon that ate a basketball, really... so I'm excused. Anyways, the Euro shams are added and I plan to add a new throw to the bottom of the bed for some extra color and texture. I've also got big plans for some awesome pillow action with more U-Fab fabric. Here's a sneak peek! 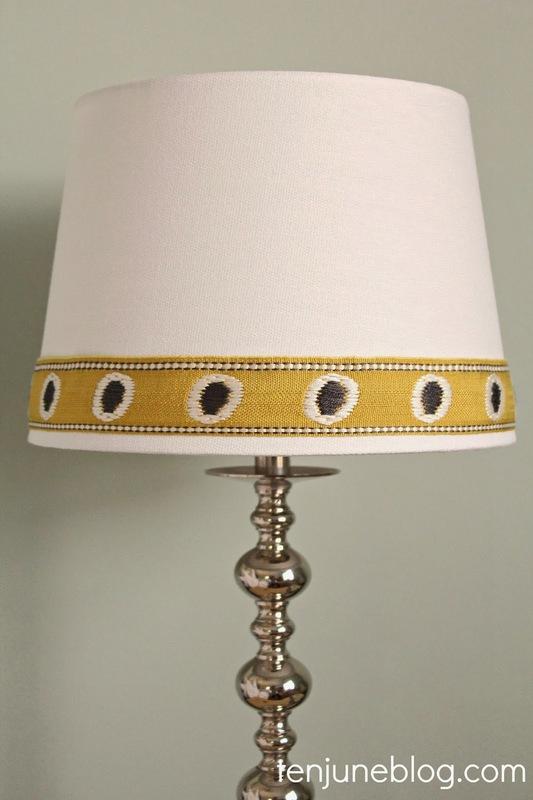 I think just those two little changes with the lampshades and Euro shams have made a big difference, don't you? Oh and we've got a few temporary new changes in the bedroom, as well... a rocker and bassinet for Little Lady June! She'll be sleeping in here for a month or two when she finally arrives. 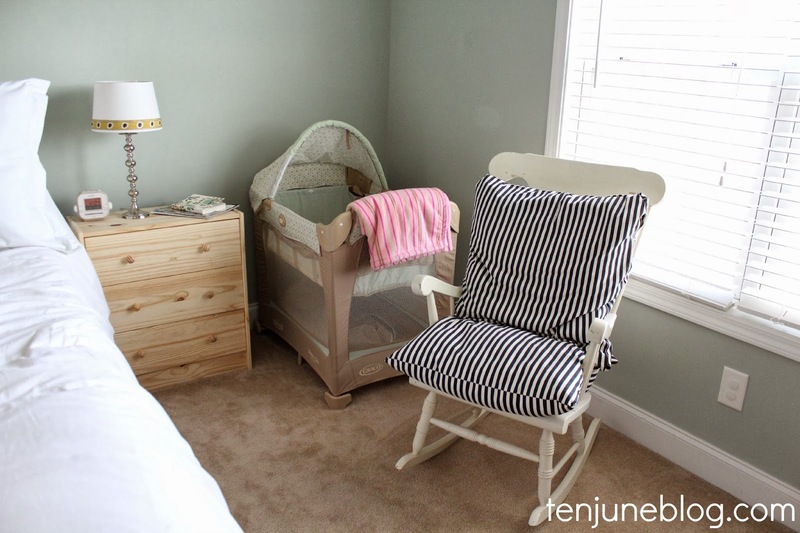 We're lucky to have such a large master bedroom space for all of this baby gear! 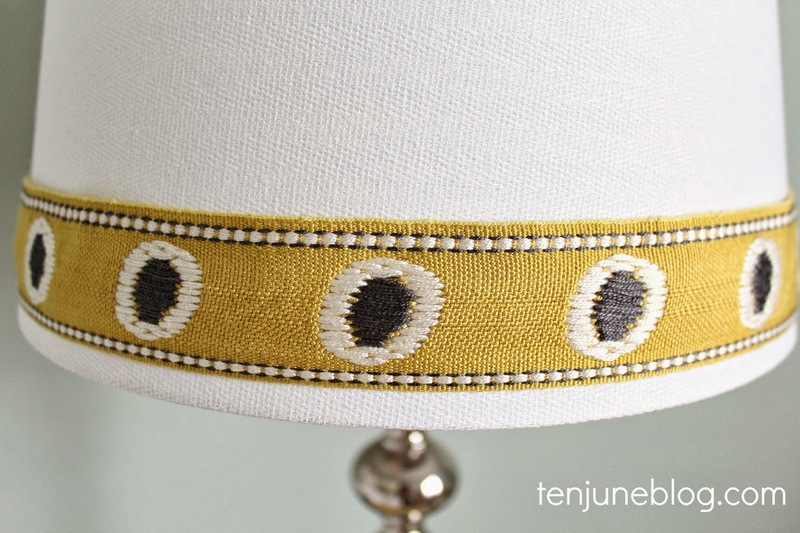 Isn't it amazing what a little fabric trim does to dress up a plain lampshade?! Don't forget to let me know your thoughts... gold Rub and Buff the lamp bases or not?! That blue and white lamp is gorgeous. I am kicking myself to this day for not picking up a pair of them I passed up at goodwill! Cant wait to see the pillows in that gorgeous fabric and trim! I have never been a fan of gold and can't understand why it's a fad right now. However, I think the gold lamp bases would look good with that new trim. I think it depends on what you do with the nightstands. I think the silver is beautiful, but if you went with a navy for the nightstands, gold lamps would be gorgeous with that. Do you have plans? We have a U-Fab and I've been dying to check it out! I definitely think that gold bases would look amazing with that gold trim! What are you waiting for?! The Chesterfield outlet is stock full of our closeouts/remnants for just $7.99/yd :) Hope to see you soon, Ashley! I think this is my first time posting! I love your blog and I am a fellow Georgia peach. I just haven't been able to love gold. I like it in a nursery or as small tiny accents, but when I see a gold lamp all I think of are the castaways at thrift stores. Gold and brassy. I would totally go navy. 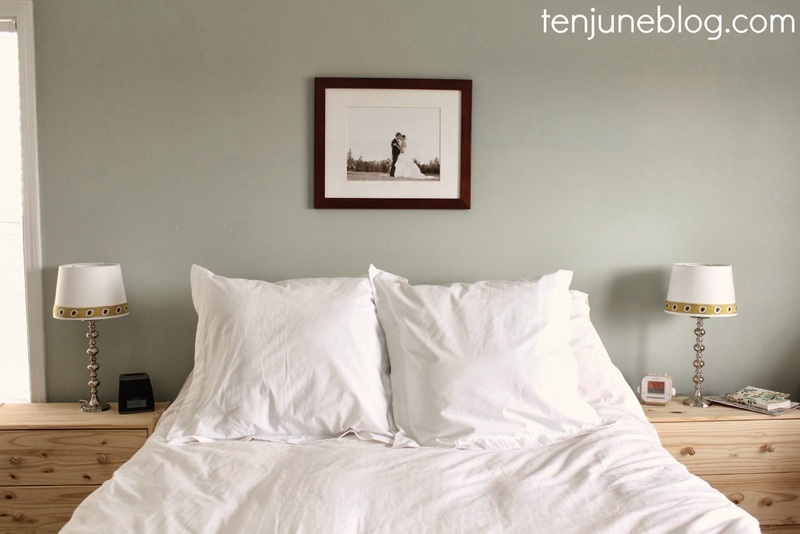 And I would have navy accents all over that crisp white bed. Keep up the awesome work! That shade is adorable! love the silver lamps as is, they are timeless and pretty. If they were yucky looking, I'd vote to make them gold, but why mess with a good thing? 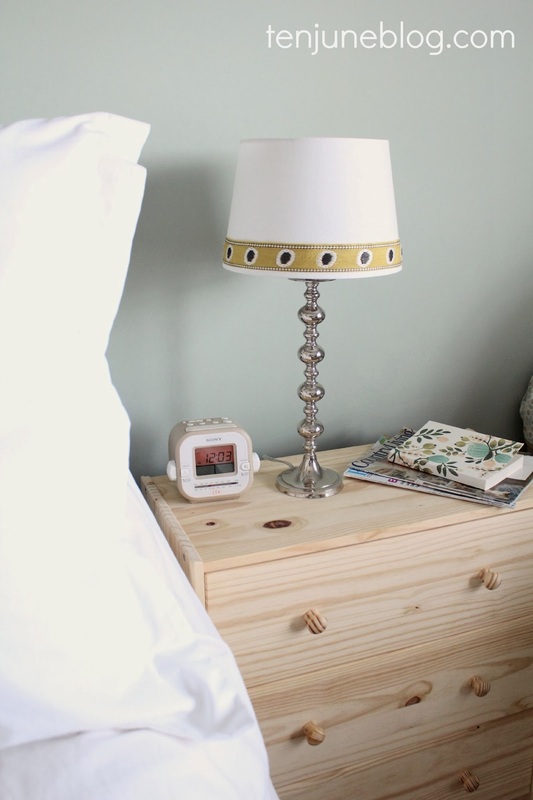 As for the nightstands, navy! It would help to ground the space provide a little contrast with the light elements. What about the same finish as your mirror on the opposite wall? I agree with the above comment about matching it to the mirror, unless you're comfortable mixing metals. I'm not, but I've seen it done well. I also think the navy blue dressers would look really nice. Love your blog!